This article was previously published in the World Economic Forum Blog, on February 26, 2019. Abundant, cost-effective and reliable internet access is a basic pillar of any future-oriented education system. It democratizes student access to information and educational content; enables teachers to leverage cutting-edge teaching tools; eliminates geographical barriers; and facilitates interaction with teachers and colleagues. If applied wisely, internet access can also help improve lagging education systems, which are often challenged by issues such as lack of teachers outside large urban centres and inefficient book distribution logistics. In the early 2000s, many countries around the world launched school connectivity programmes. In Uruguay, the United States and Australia, almost all schools today have internet-connected computer rooms. Other countries were less successful in implementing such programmes. In Brazil, for example, the school connectivity programme of the mid-2000s aimed to bring a 1 Mbps connection to every public school. Ten years later, when the programme had finally been deployed to most schools, there was limited practical use for such capacity. The recommended broadband speeds of today are 300 times faster than the project goal. 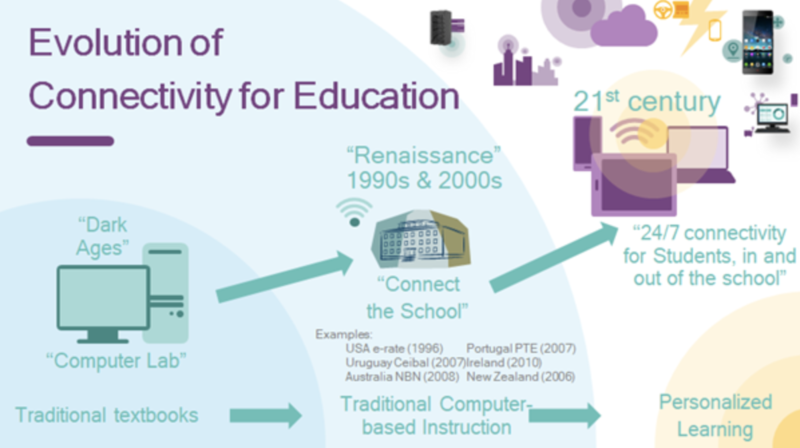 Many programmes also failed to acknowledge and adapt for innovation in connectivity-enabled learning and teaching models, as they were built around the “connect the school” paradigm. But connecting only the school has many problems and practical implications. For example, “flipped classrooms”, personalized learning and “one device per student” require connected students 24/7, in and out of school. The so-called “homework gap”, where teachers are reluctant to ask students to use the internet outside school because many don’t have access at home, is another obvious flaw of these programmes, present even in developed economies. With half the world not connected to the internet, such flaws become very relevant. The amount of time students spend in front of screens while in school is also a concern for many educators. School time, those experts say, should be used for student-teacher interaction, social collaboration and “soft” skills development. At home, students can leverage screen time for content and online interaction. That is not possible with programmes that do not account for out-of-school connectivity. From a technology perspective, the early education connectivity programmes missed the mobile data revolution. When they were launched, smartphones and 3G/4G networks did not exist (the first smartphone was launched in 2008). This has serious cost, scalability and governance implications. Many students already own a smartphone, but cannot use it for educational purposes while in school. Connected schools today require costly onsite technicians to function properly, or risk low internet availability and intermittent service, defeating the purpose of being connected in the first place. Those technicians cost the schools three-and-a-half times more than the internet link itself. An extreme case of this trend is Colégio Bandeirantes. A leading K-12 institution in São Paulo, Brazil, it uses internet intensively to support learning for its 2,800 students. Its IT staff exceeds 45 people. While this level of support is great for students of this school, it is neither sustainable nor scalable at a national level. The economics would not work, and there are not enough people to fill the almost one million roles it would create, especially outside the major urban areas. Countries willing to implement or revamp student connectivity programmes can and should leapfrog those early education-focused connectivity programmes. They should aim for 24/7 connectivity for students in and out of school, and select technologies that support such a vision. They should adopt forward-looking internet speed requirements, and take into account the mobile revolution - by taking advantage of Bring Your Own Device (BYOD) policies, for example. Economic sustainability and scalability should be considered, especially for indirect and other hidden costs such as support and maintenance. Overall, the design of these new programmes should incorporate recent technological breakthroughs in pedagogical thinking and in mobile communications. This brings future-proofing and flexibility, so that teachers and school administrators can choose whatever methodologies and tools make most sense for students at any given time. A robust, future-proof and cost-efficient internet connection for students is the foundation of a 21st-century education. A small school in the rural outskirts of Vitória de Santo Antão, Brazil, shows how this can be done. Escola Manoel Domingos de Mello was the test bed for a pilot jointly developed by Qualcomm and Telefônica, and implemented with the pedagogical support of the Recife Center for Advanced Studies and Systems (CESAR). Even though it is located in a poor, remote area, it was the Brazilian school with the highest internet speed per student in 2017, and likely the one with the most reliable internet connection (based on qualitative assessments, as there are no statistics on internet availability - other than it is really important). This is an impressive achievement, especially because, in contrast to the 45+ IT staff of the (much larger) Colégio Bandeirantes, there are no onsite individuals dedicated to managing the connectivity infrastructure. How can students of a rural school in a poor region of Brazil have some of the country’s better, faster and cheaper internet? What has been done to ensure students are connected not only at school, but also at home and in transit? And which governance, procurement and scalability innovations can enable this model to scale cost-efficiently to tens of millions of students? Answers to these questions contain important insights for any future-oriented education connectivity programmes. Sítio do Oiteiro is a small rural village connected by a 15-kilometre dirt road to the city of Vitoria de Santo Antão, in northeastern Brazil. Its 600 inhabitants live on the output of small bean crops. The village’s children attend the only school in the region, which has 200 enrolled students from first to ninth grade. The school’s principal and six teachers come by bus every day from nearby cities. No internet provider has ever reached the village, but cellular and mobile data service is available - as for 99% of Brazil’s population - although not with enough capacity for school internet use. To connect the school to the internet in the way 20th century programmes advised would require many resources. The school’s principal, who, like many other school principals in Brazil, did not complete a college degree, would need to specify and procure routers, switches and hotspots. She would also need to manage passwords, channels and interference, firewalls and content filtering. A team would have to be hired to monitor the network 24/7 to ensure reliability - or risk preventing teachers from using the internet in class. Instead, Escola Manoel Domingos de Mello chose to outsource all these technical activities to Mobile Network Operators (MNO), which have the scale and expertise benefit of running professionally managed networks for hundreds of millions of customers in Brazil. These operators already employ tens of thousands of engineers and technicians who set up and manage connectivity networks much more efficiently than any single school, or group of schools, could. The MNO has installed dedicated infrastructure on school premises (a 4G small base station and a radio backhaul). Students and teachers, equipped with 4G-enabled tablets, use this infrastructure to access high-speed, reliable internet. Because of the MNOs’ economies of scale, they should be able to provide connectivity at a lower total-cost-of-ownership than the old programmes. But the most important benefit of outsourcing the connectivity infrastructure to the MNOs is that students can be connected to educational content on the internet both in and out of school, 24/7. Students benefit from the virtually ubiquitous coverage that MNOs provide, remaining connected even when out of school (and those who live close to school benefit even more from high speeds). Providing out-of-school connectivity with 20th-century paradigms would be prohibitively expensive. This experience shows one way in which infrastructure can be deployed to provide connectivity to students 24/7, no matter where they live. This connectivity, together with teacher training and the curation of relevant educational content, is how education systems can take advantage of the current revolution and improve learning, which is the ultimate objective of deploying technology in schools. ¿Puede Internet potenciar el aprendizaje en América Latina? Se puede medir a nivel mundial el desarrollo infantil? ¿Los servicios llegan a quienes más los necesitan?